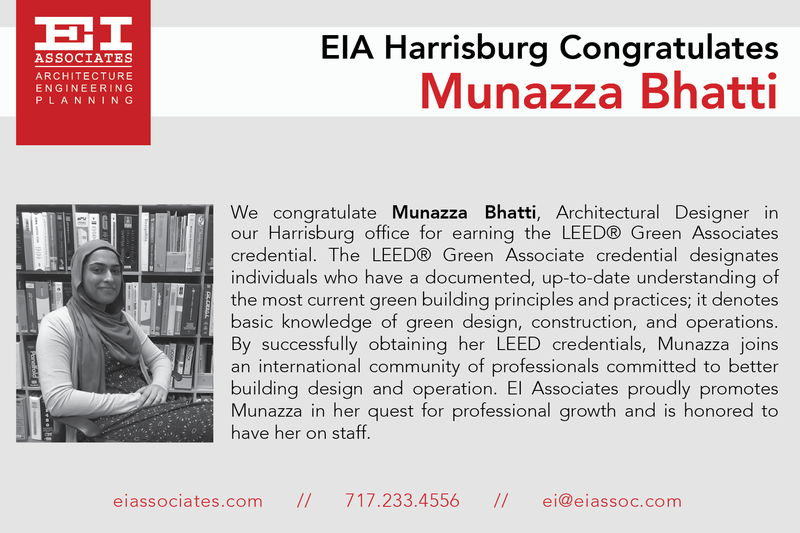 EI Associates, an architectural and engineering firm, applauds team member Munazza Bhatti for earning the LEED® Green Associate credential. Munazza is an Architectural Designer with EI Associates. Her role at EI Associates involves collaborating with designers and drafters on sustainable solutions for clients, assisting project architects with drafting responsibilities, and the architectural visualization of buildings. She also provides documentation for LEED® Certified buildings. The LEED® Green Associate credential she has earned demonstrates her knowledge and up-to-date understanding of current green building principles and practices. The LEED® Green Associate is a foundational credential and for many it is the first step before earning advanced credentials such as the LEED® AP with specialty. Munazza is a graduate of Temple University with a Masters in Environmental Building Design from the University of Pennsylvania. She has been with EI Associates since 2016. LEED®, or Leadership in Energy and Environmental Design, is green building and is the most widely used green building rating system in the world. Available for virtually all building, community and home project types, LEED® provides a framework to create healthy, highly efficient and cost-saving green buildings. LEED® certification is a globally recognized symbol of sustainability achievement. EI Associates is a leader in sustainable design and currently has 25 certified projects with an additional 9 registered projects that are seeking various levels of LEED® certification. EI Associates has been providing architectural designs and engineering solutions since 1934. EI Associates is a full-service, multi-disciplined architecture, engineering, and construction management firm with offices in New Jersey and Pennsylvania. Our diverse staff of over 100 planners, architects, interior designers, engineers, estimators, and construction professionals has been serving corporate, educational, life science, industrial, and government clients for the last 80 years.